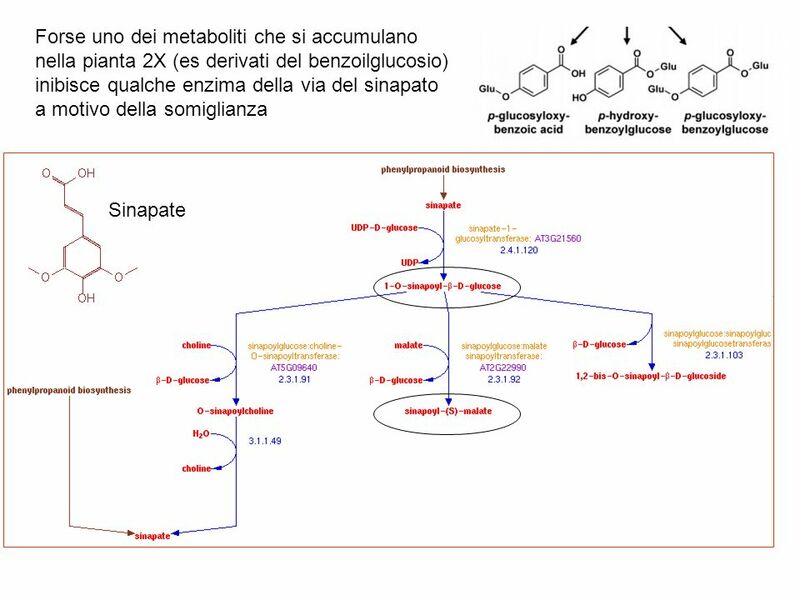 Una visione sistematica per lingegneria metabolica Creazione di vie metaboliche. 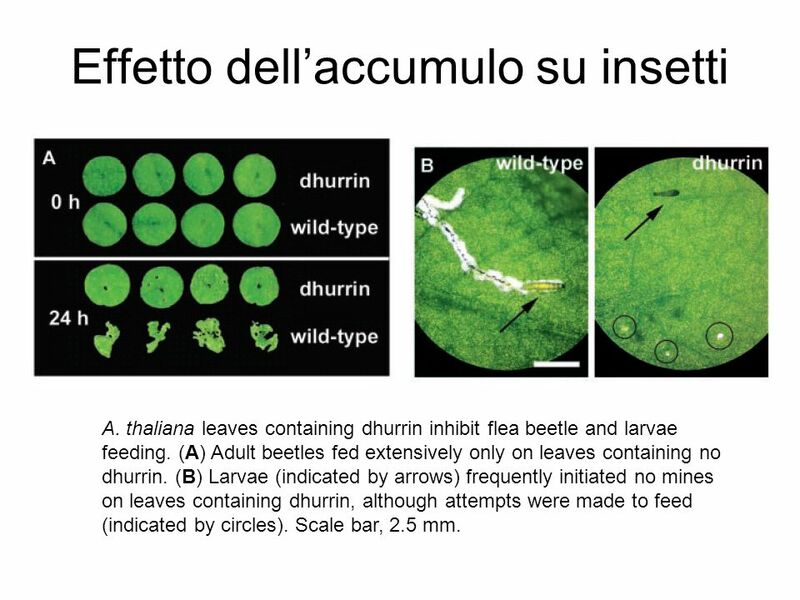 7 Effetto dellaccumulo su insetti A. thaliana leaves containing dhurrin inhibit flea beetle and larvae feeding. (A) Adult beetles fed extensively only on leaves containing no dhurrin. (B) Larvae (indicated by arrows) frequently initiated no mines on leaves containing dhurrin, although attempts were made to feed (indicated by circles). Scale bar, 2.5 mm. 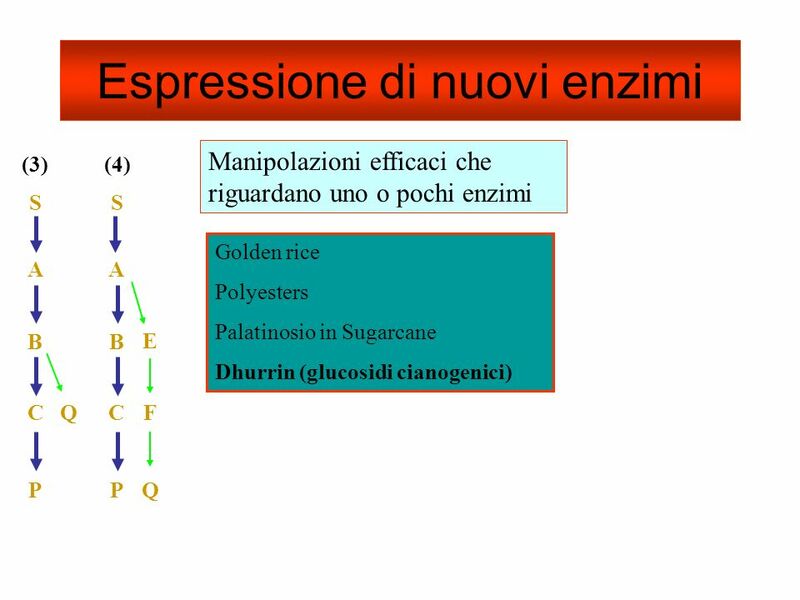 8 Effetto sulle larve Nearly all larvae (98%) presented to leaves containing about 4 mg of dhurrin/gfw died. 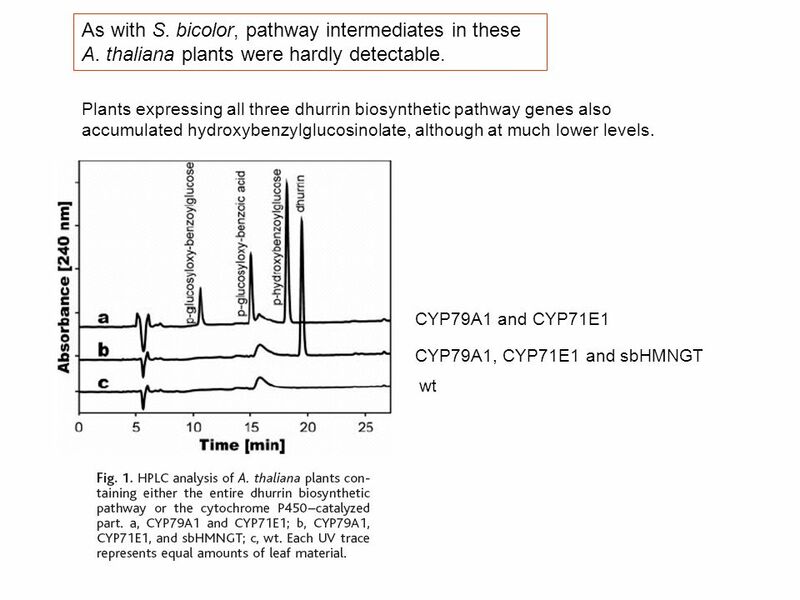 Transgenic A. thaliana plants released high levels of HCN, up to 2 μ mol/gfw, upon tissue damage. 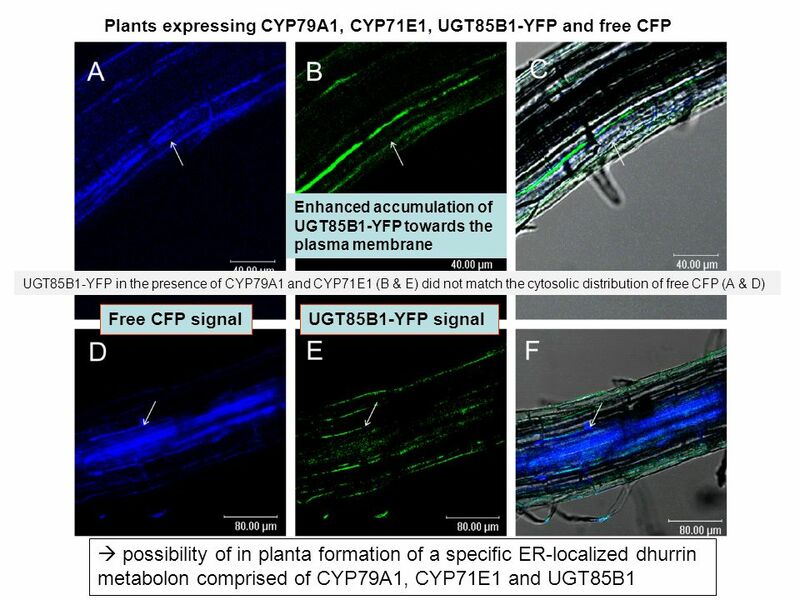 An endogenous β-glucosidase with dhurrin hydrolyzing activity is present in A. thaliana. 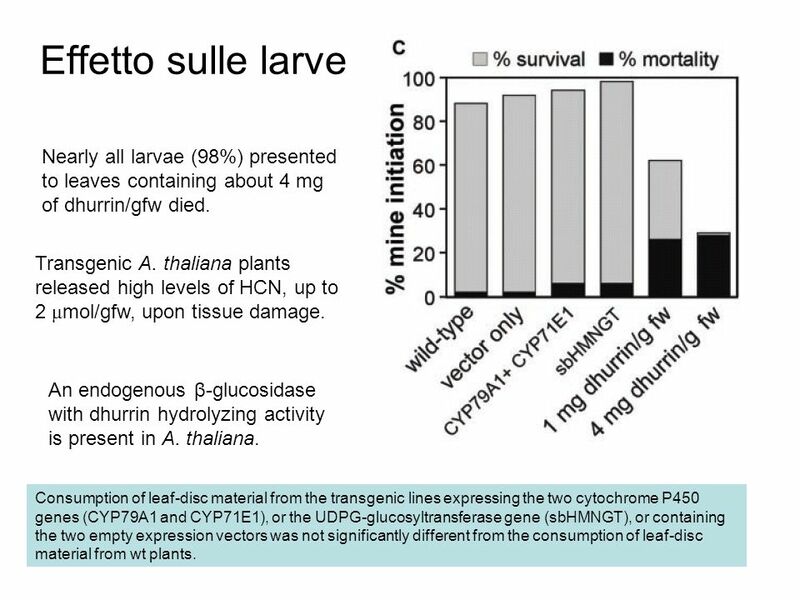 Consumption of leaf-disc material from the transgenic lines expressing the two cytochrome P450 genes (CYP79A1 and CYP71E1), or the UDPG-glucosyltransferase gene (sbHMNGT), or containing the two empty expression vectors was not significantly different from the consumption of leaf-disc material from wt plants. 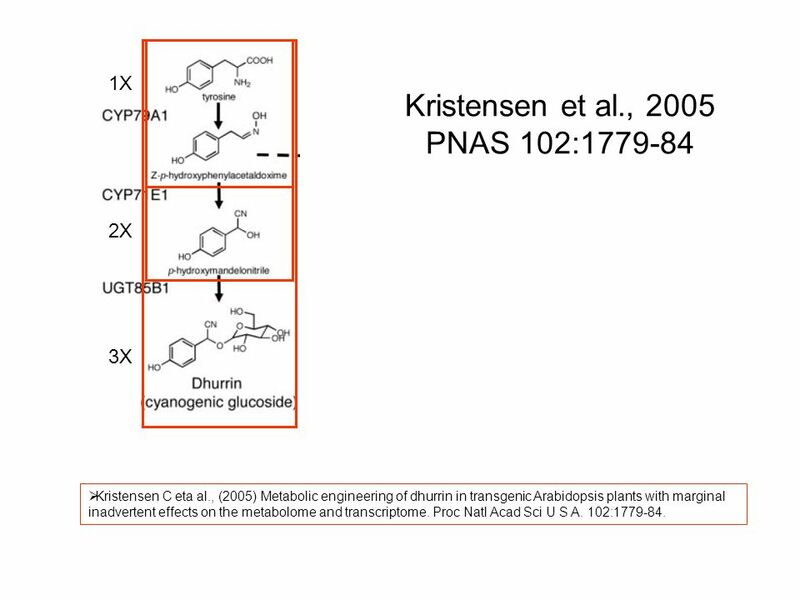 10 1X 2X 3X Kristensen et al., 2005 PNAS 102:1779-84 Kristensen C eta al., (2005) Metabolic engineering of dhurrin in transgenic Arabidopsis plants with marginal inadvertent effects on the metabolome and transcriptome. Proc Natl Acad Sci U S A. 102:1779-84. 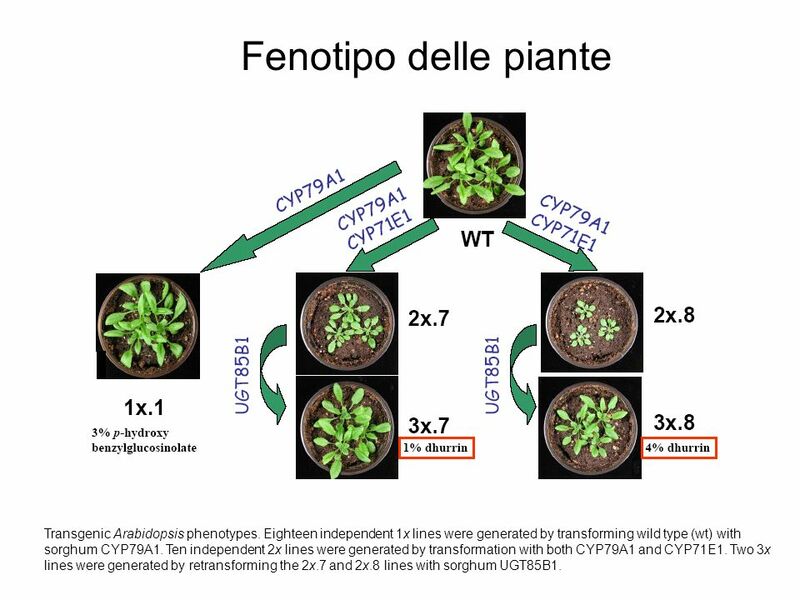 11 Fenotipo delle piante Transgenic Arabidopsis phenotypes. 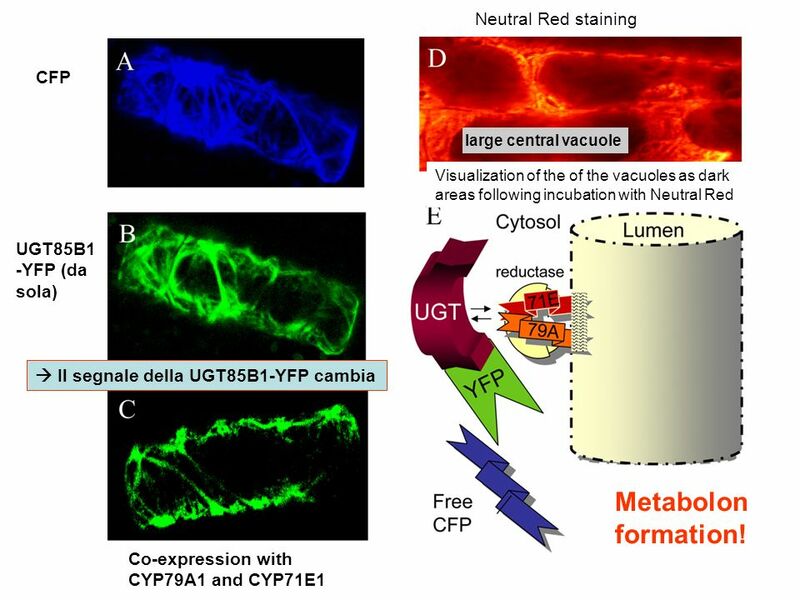 Eighteen independent 1x lines were generated by transforming wild type (wt) with sorghum CYP79A1. Ten independent 2x lines were generated by transformation with both CYP79A1 and CYP71E1. Two 3x lines were generated by retransforming the 2x.7 and 2x.8 lines with sorghum UGT85B1. 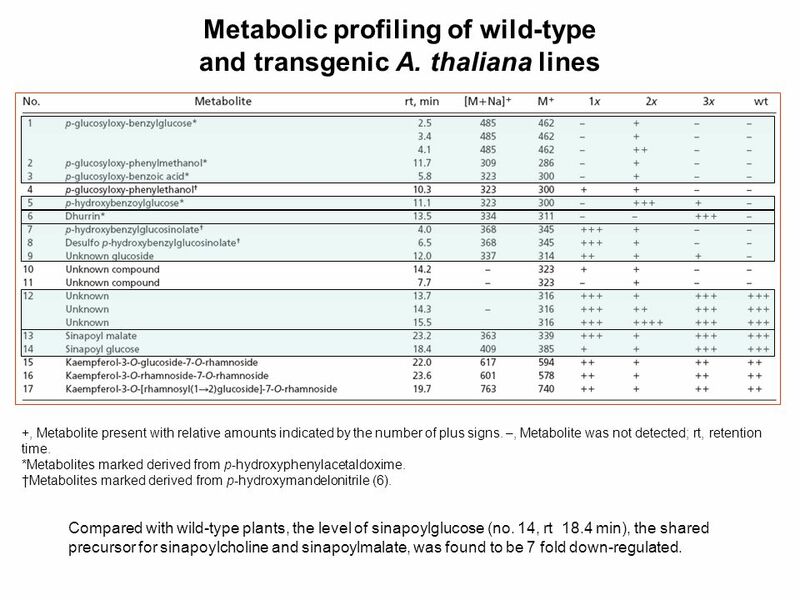 14 Metabolic profiling of wild-type and transgenic A. thaliana lines +, Metabolite present with relative amounts indicated by the number of plus signs. –, Metabolite was not detected; rt, retention time. 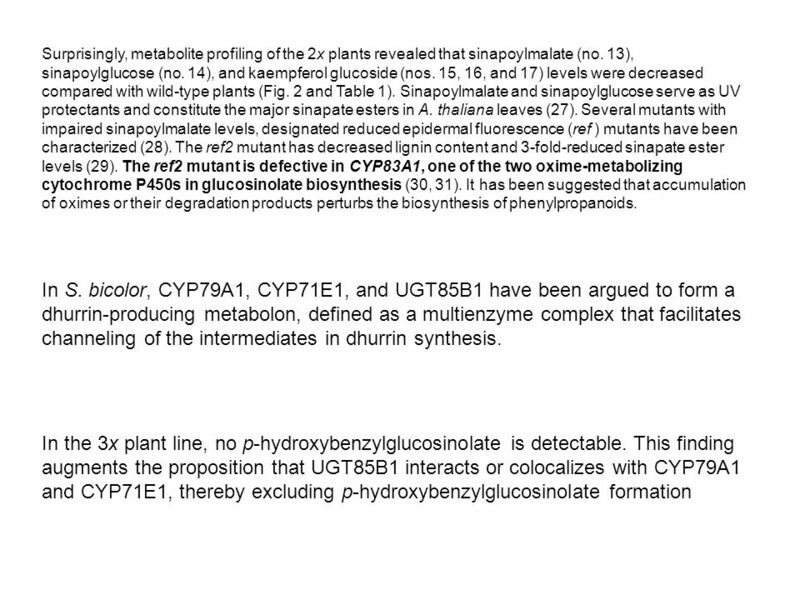 *Metabolites marked derived from p-hydroxyphenylacetaldoxime. Metabolites marked derived from p-hydroxymandelonitrile (6). Compared with wild-type plants, the level of sinapoylglucose (no. 14, rt 18.4 min), the shared precursor for sinapoylcholine and sinapoylmalate, was found to be 7 fold down-regulated. 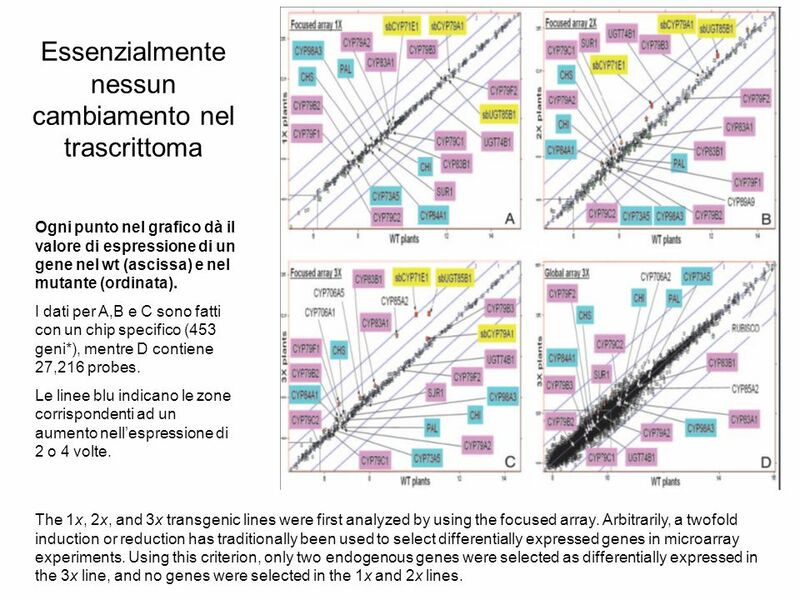 20 Essenzialmente nessun cambiamento nel trascrittoma The 1x, 2x, and 3x transgenic lines were first analyzed by using the focused array. Arbitrarily, a twofold induction or reduction has traditionally been used to select differentially expressed genes in microarray experiments. Using this criterion, only two endogenous genes were selected as differentially expressed in the 3x line, and no genes were selected in the 1x and 2x lines. Ogni punto nel grafico dà il valore di espressione di un gene nel wt (ascissa) e nel mutante (ordinata). 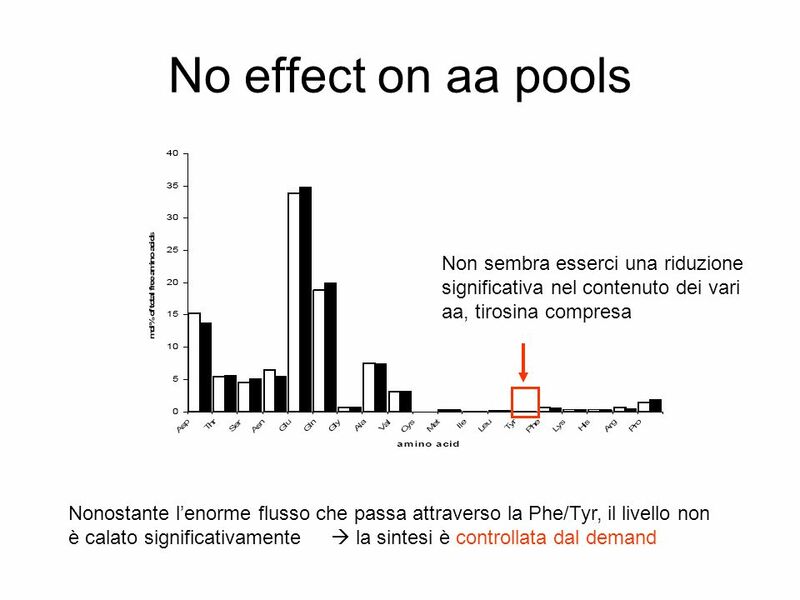 I dati per A,B e C sono fatti con un chip specifico (453 geni*), mentre D contiene 27,216 probes. Le linee blu indicano le zone corrispondenti ad un aumento nellespressione di 2 o 4 volte. 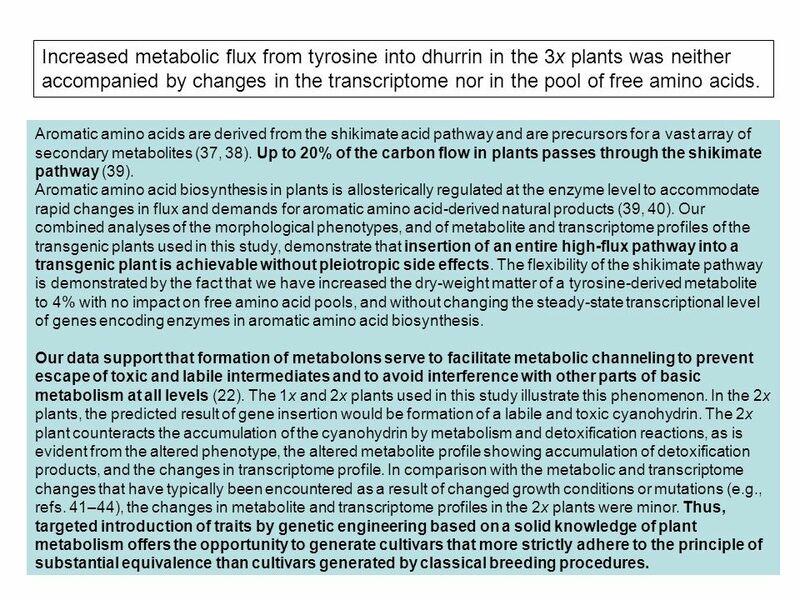 22 Increased metabolic flux from tyrosine into dhurrin in the 3x plants was neither accompanied by changes in the transcriptome nor in the pool of free amino acids. Aromatic amino acids are derived from the shikimate acid pathway and are precursors for a vast array of secondary metabolites (37, 38). Up to 20% of the carbon flow in plants passes through the shikimate pathway (39). 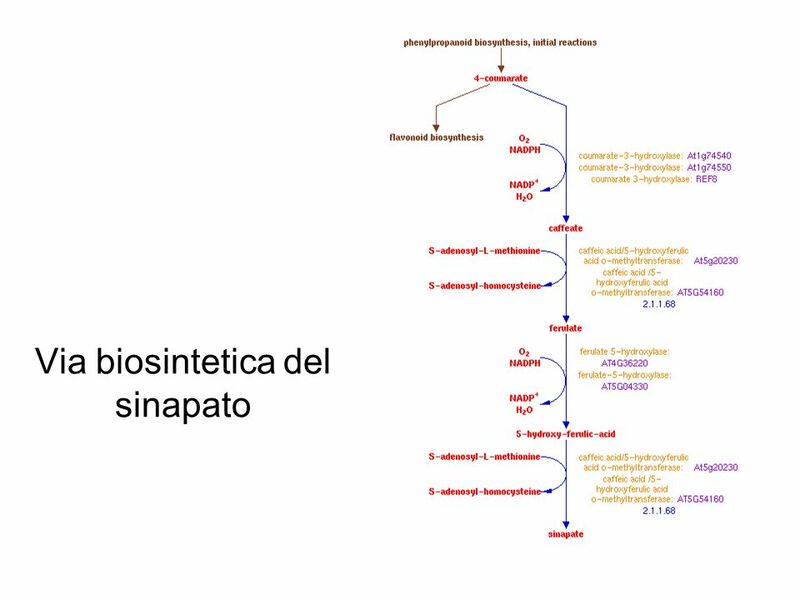 Aromatic amino acid biosynthesis in plants is allosterically regulated at the enzyme level to accommodate rapid changes in flux and demands for aromatic amino acid-derived natural products (39, 40). 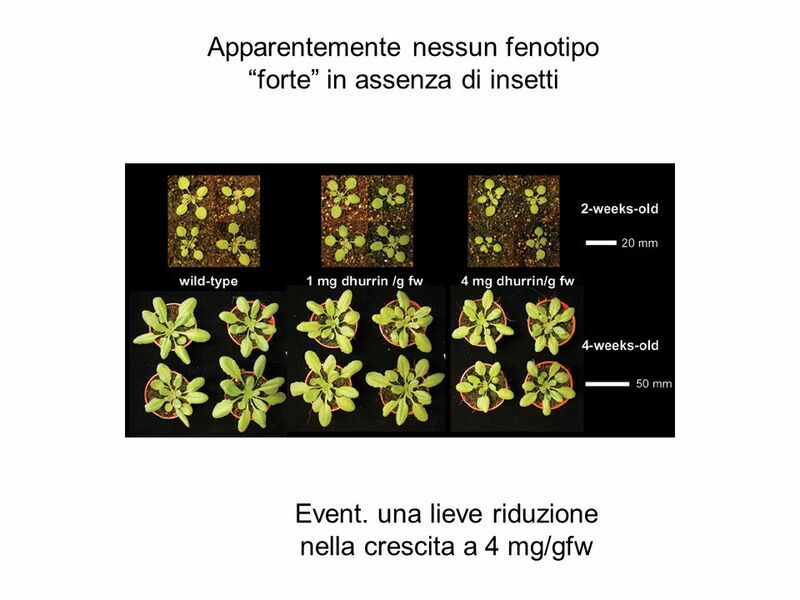 Our combined analyses of the morphological phenotypes, and of metabolite and transcriptome profiles of the transgenic plants used in this study, demonstrate that insertion of an entire high-flux pathway into a transgenic plant is achievable without pleiotropic side effects. 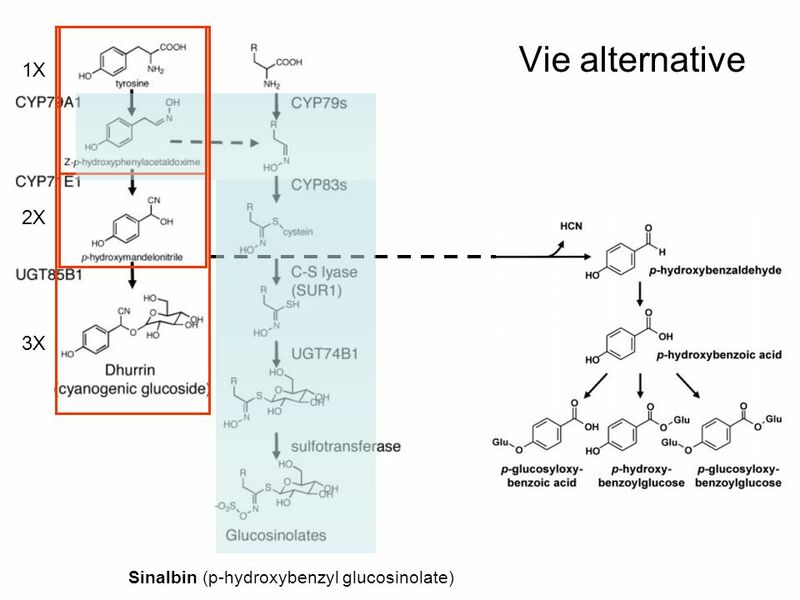 The flexibility of the shikimate pathway is demonstrated by the fact that we have increased the dry-weight matter of a tyrosine-derived metabolite to 4% with no impact on free amino acid pools, and without changing the steady-state transcriptional level of genes encoding enzymes in aromatic amino acid biosynthesis. 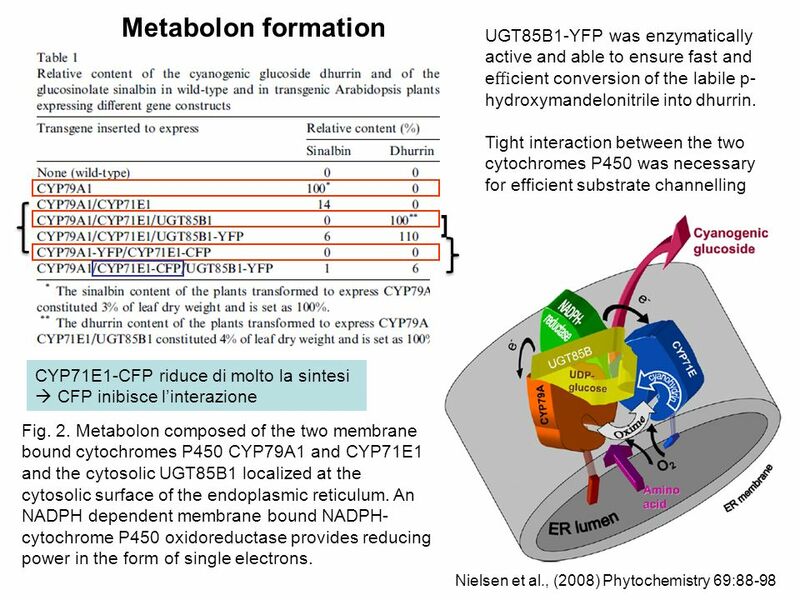 Our data support that formation of metabolons serve to facilitate metabolic channeling to prevent escape of toxic and labile intermediates and to avoid interference with other parts of basic metabolism at all levels (22). The 1x and 2x plants used in this study illustrate this phenomenon. 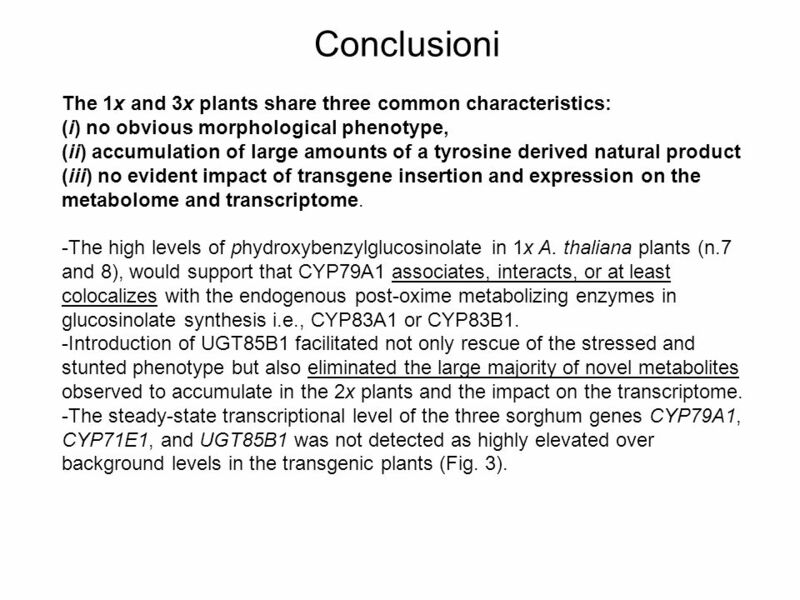 In the 2x plants, the predicted result of gene insertion would be formation of a labile and toxic cyanohydrin. 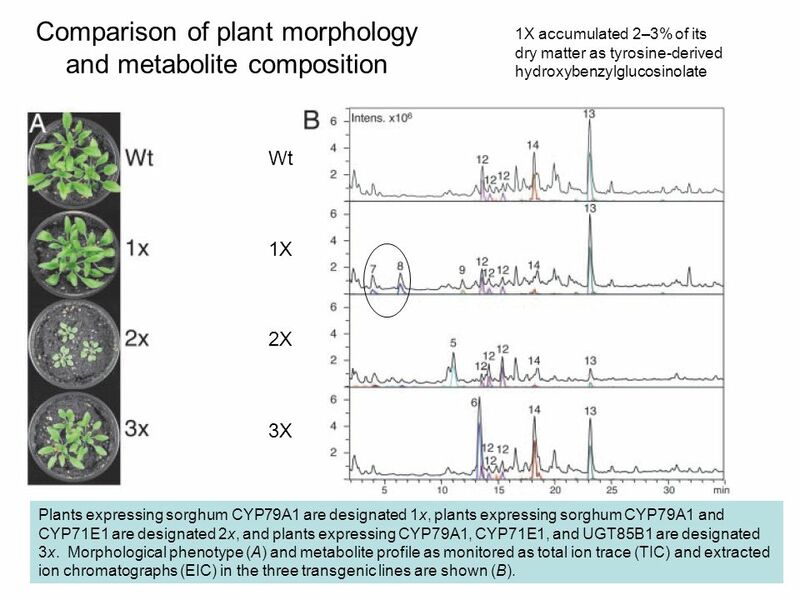 The 2x plant counteracts the accumulation of the cyanohydrin by metabolism and detoxification reactions, as is evident from the altered phenotype, the altered metabolite profile showing accumulation of detoxification products, and the changes in transcriptome profile. In comparison with the metabolic and transcriptome changes that have typically been encountered as a result of changed growth conditions or mutations (e.g., refs. 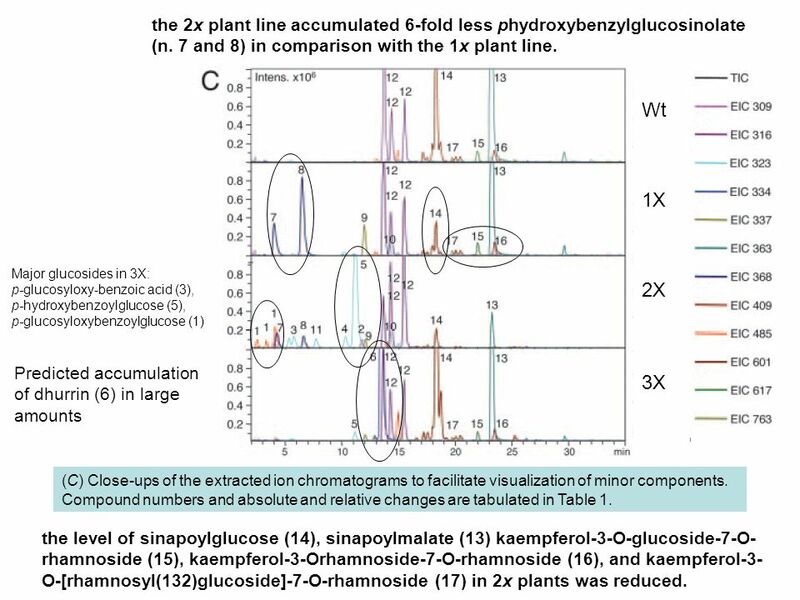 41–44), the changes in metabolite and transcriptome profiles in the 2x plants were minor. 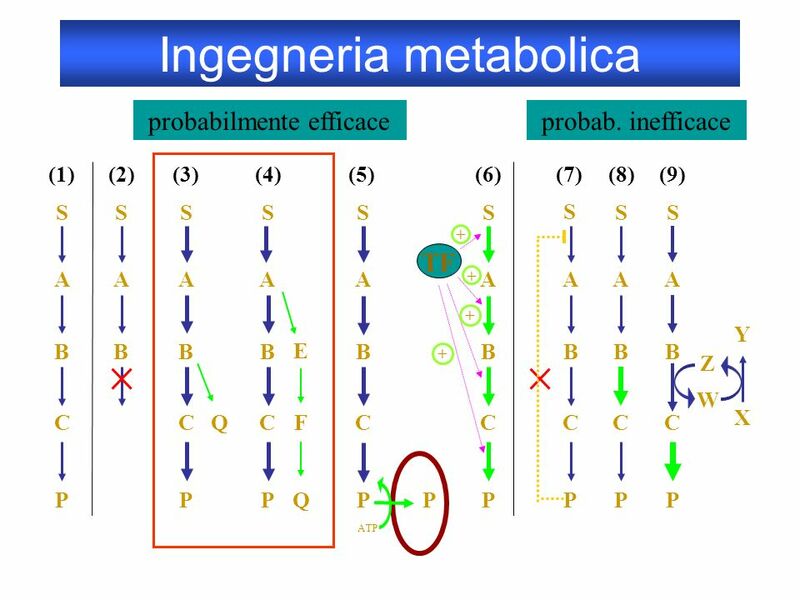 Thus, targeted introduction of traits by genetic engineering based on a solid knowledge of plant metabolism offers the opportunity to generate cultivars that more strictly adhere to the principle of substantial equivalence than cultivars generated by classical breeding procedures. 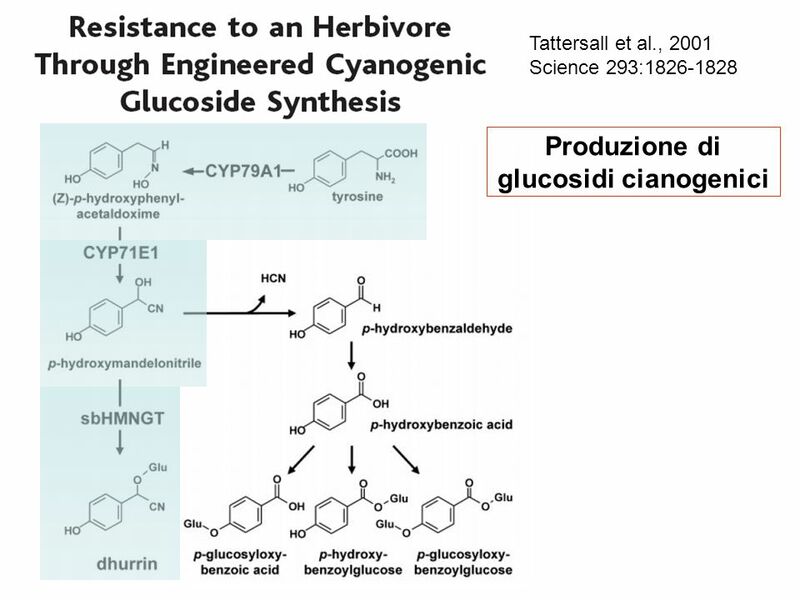 27 Bibliografia Tattersall DB et al., (2001) Resistance to an herbivore through engineered cyanogenic glucoside synthesis. Science 293:1826-8. 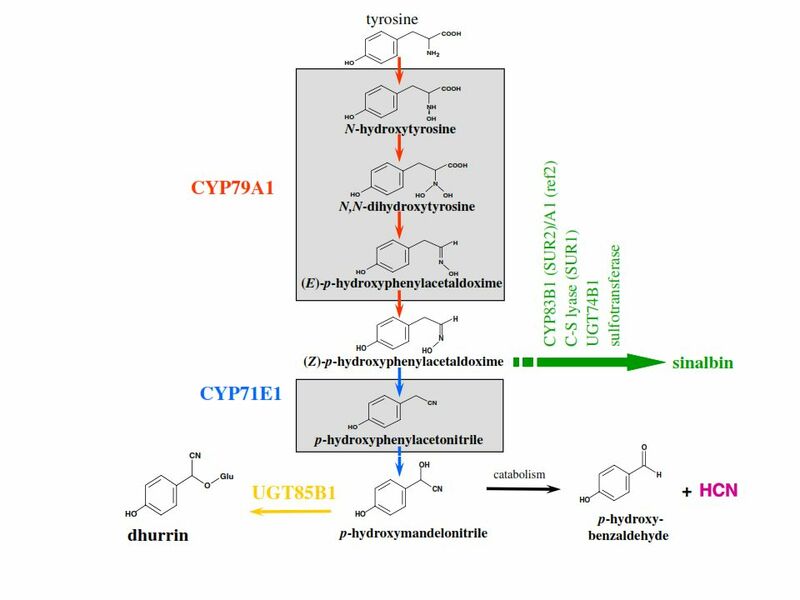 Kristensen C et al., (2005) Metabolic engineering of dhurrin in transgenic Arabidopsis plants with marginal inadvertent effects on the metabolome and transcriptome. Proc Natl Acad Sci U S A. 102:1779-84. 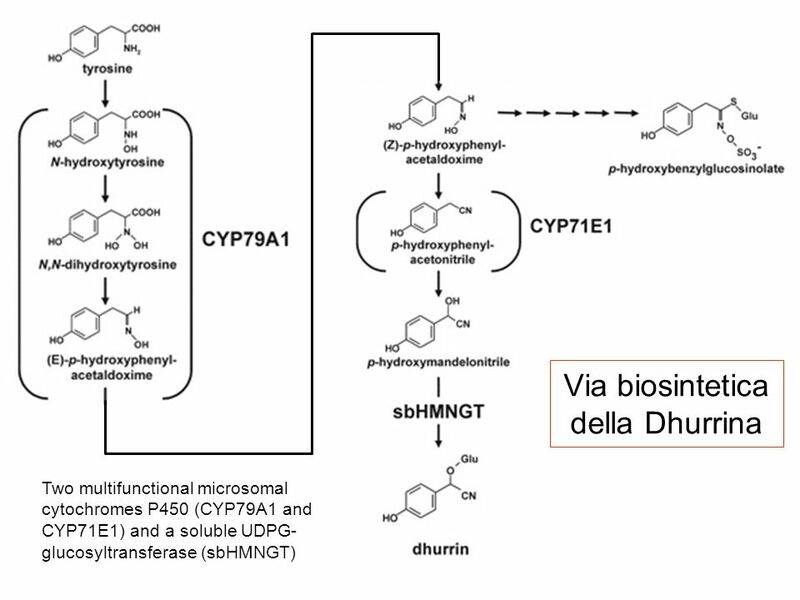 Nielsen et al., (2008) Metabolon formation in dhurrin biosynthesis. Phytochemistry 69:88-98. Jørgensen et al. 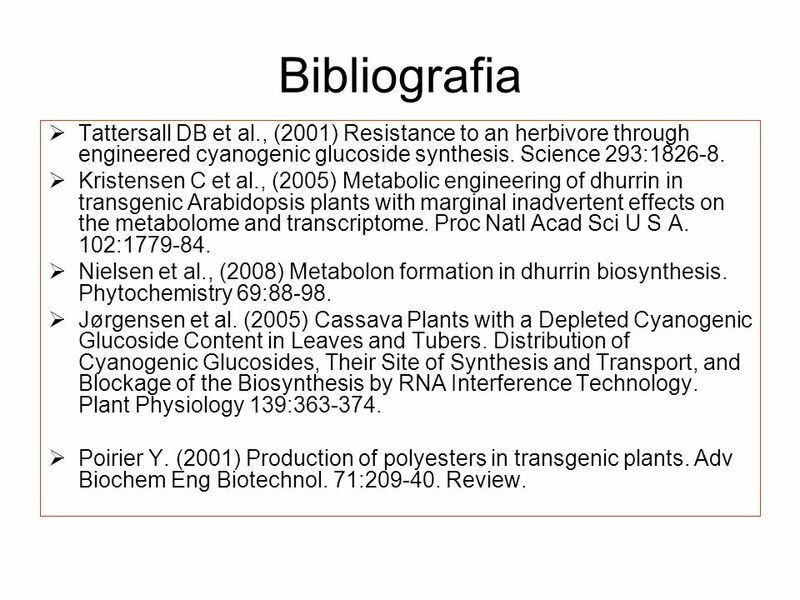 (2005) Cassava Plants with a Depleted Cyanogenic Glucoside Content in Leaves and Tubers. Distribution of Cyanogenic Glucosides, Their Site of Synthesis and Transport, and Blockage of the Biosynthesis by RNA Interference Technology. Plant Physiology 139:363-374. Poirier Y. (2001) Production of polyesters in transgenic plants. Adv Biochem Eng Biotechnol. 71:209-40. Review. 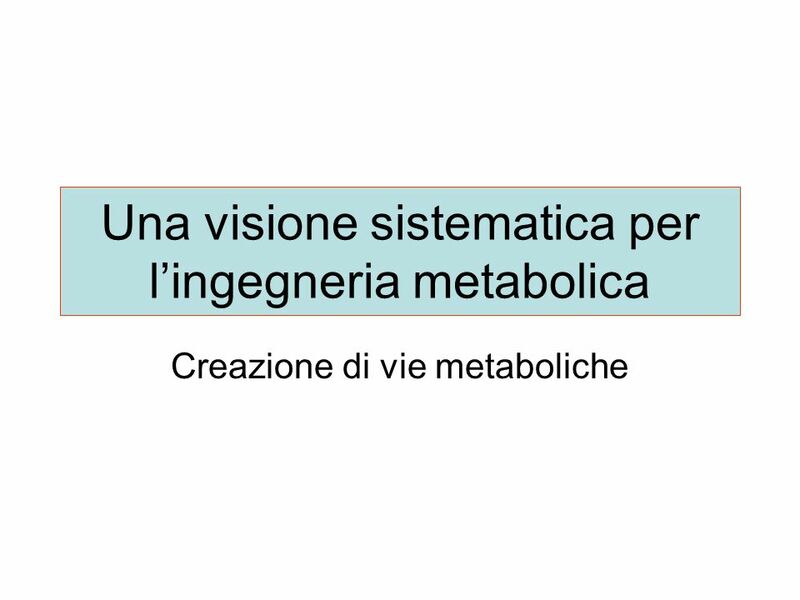 Download ppt "Una visione sistematica per lingegneria metabolica Creazione di vie metaboliche." 1 HIV Drug Resistance Training Module 7: HIV Genotyping Assay Validation. Control of mitochondrial gene expression Nuclear encoded mitochondrial gene expression Mitochondrial encoded genes Must be coordinated All of the enzymes. Cancer-inducing genes - CRGs (cooperation response genes) Paper Presentation Nadine Sündermann. Chapter 4 - Fiber Objectives Learn the differences between dietary fiber and functional fiber and be able to give an example of each Understand how fiber.